Apple has shown off some of the 100 new features to be included in the iPhone operating system later this year. The update includes a mobile advertising platform called iAd that will be used to place adverts in applications made by third parties. Apple founder Steve Jobs also showcased a long-awaited multi-tasking feature, which will allow users to run more than one program at a time. The feature is already included in many other smartphones. iAd marks Apple's first foray into a potentially lucrative new market, and pits it directly against Google's search engine advertising model. Apple will allow external developers to pocket 60% of ad revenue from iAd. The Apple boss said the iPhone OS 4.0 update will be released first for the iPhone and iPod touch, and then the iPad, later this year. Mr Jobs gave a demonstration of the multi-tasking feature showed the online radio station Pandora running in the background playing music while a user could either read news online or deal with e-mail. "We weren't the first to this party but we're going to be the best," he said. Some of the other features unveiled at the presentation at Apple's headquarters in California include being able to create specific folders to store third party applications downloaded from iTunes, enhanced mail, which will gather e-mail from multiple accounts into one "unified" inbox and iBooks, which is already on the iPad. 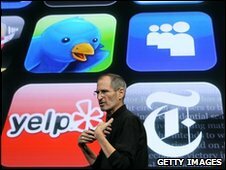 Mr Jobs said mobile users spend more time inside applications than searching the internet. Therefore it made sense to have adverts within the applications - or apps as they are commonly known. "It's very clear that [Mr] Jobs believes that ads in the context of apps makes more sense than generic mobile search," said Tim Bajarin at consulting company Creative Strategies. Apple's move into mobile advertising was widely expected after it bought Quattro Wireless mobile advertising network for almost $300m (£196m) in January. Analysts say revenue from mobile advertising will jump dramatically this year. "It has huge potential to really change mobile commerce," said Van Baker, Vice president of research at Gartner. "The evidence so far is that very few transactions really happen in this space. Mobile is used to compare prices, find restaurants, movie times and the like but very little in the way of commerce." 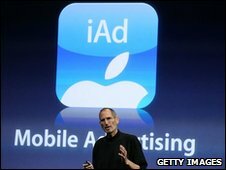 Apple bought mobile ad company Quattro after failing to buy the market leader AdMob, which was purchased by Google. In a slight to the search giant, Mr Jobs said "Google came in and snatched them (AdMob) because they didn't want us to have them". Google's deal is currently being investigated by US regulators. During the packed press event, Mr Jobs revealed that to date Apple has sold 50m iPhones. That number rises to 85m when the iPod touch is included. Mr Jobs also gave an update on the iPad, which went on sale in the US only at the weekend. It is expected in stores in the UK and part of Europe, as well as Canada and Australia at the end of the month. 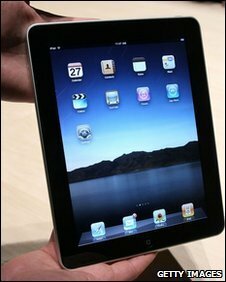 Apple said it had sold 450,000 iPads as of 8 April. Mr Jobs added that 600,000 electronic books and 3.5m applications had been downloaded for the iPad in the previous five days. "We're making them as fast as we can," Mr Jobs said. "Evidently we can't make enough of them yet so we are going to have to try harder."